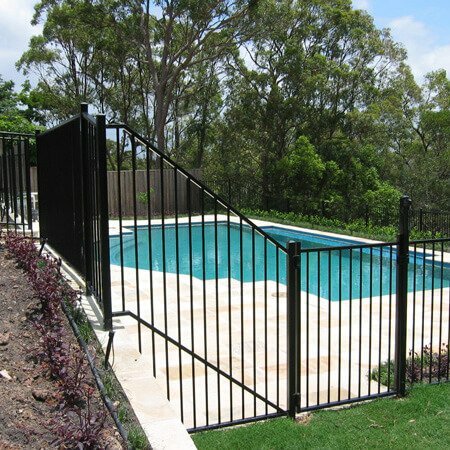 Why choose aluminium pool fencing? The main reason most people choose aluminium pool fencing is because it’s a cost-effective way to keep your pool safe. It’s not the cheapest pool fence solution, the cheapest option would be something like steel mesh fencing. But compared to glass pool fencing, aluminum fencing is definitely going to be cheaper. What are the benefits of an aluminium pool fence? Ok so mainly the reasonable cost, very low maintenance and easy installation. As a comparison, glass pool fencing is very expensive, really requires an expert to install it, and needs to either be treated to repel water stains or cleaned regularly. 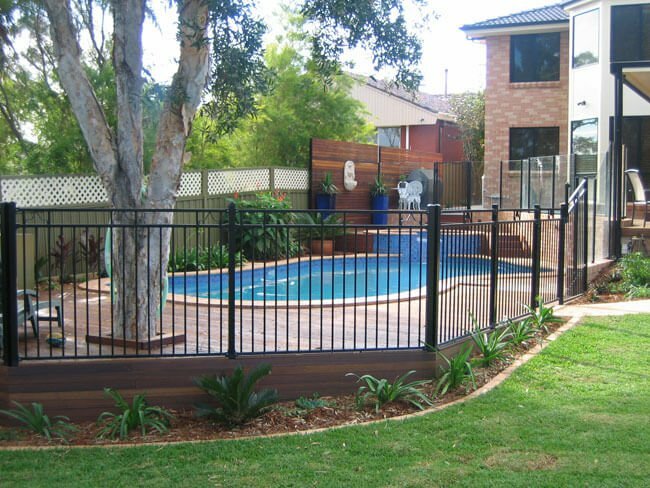 Aluminium fencing is still a good looking way to fence off your pool and is practical. Aluminium is lightweight, cost effective and does not rust, making it a fantastic choice for fencing around saltwater pools and in coastal areas. Aluminium pool fencing arrives in pre-made fence panels that attach to aluminium fence posts and is very easy to install. The posts can either be installed in-ground or ordered with a base for installing above ground. The panels feature a powder coated aluminium construction that is designed not to rust and comes in many colours. Some manufacturers offer up to 100 hundred colour choices of aluminium panels so you’ve got plenty of choice when selecting a pool fence that will best suit your backyard. A clever combination of glass pool fencing facing the house and aluminium pool fencing for the fence section further away facing the garden. What colours does aluminium pool fencing come in? Most manufacturers use industry standard powder coating for aluminium so you have a huge range of colour choices for your fence. As a guide, check out the Interpon colour finder which has over 100 powder colours. Can you use Aluminium panels for a DIY pool fence? Most pool fence suppliers offer aluminium panels as a DIY kit because the panels come in standard sizes. When choosing a supplier make sure that the panels are manufactured to 1200mm high, so that they comply with Australia Standard AS1926.1(2012) for pool fencing. Remember, All swimming pool fences are a safety product, and must be manufactured and installed to comply with this standard. Panel widths are usually in standard sizes of 2400mm and 3000mm or you can order custom sizes if required. Aluminium Gates have a standard width of 970mm to suit a 1000mm opening, or again, they can be made to suit the opening size you need. 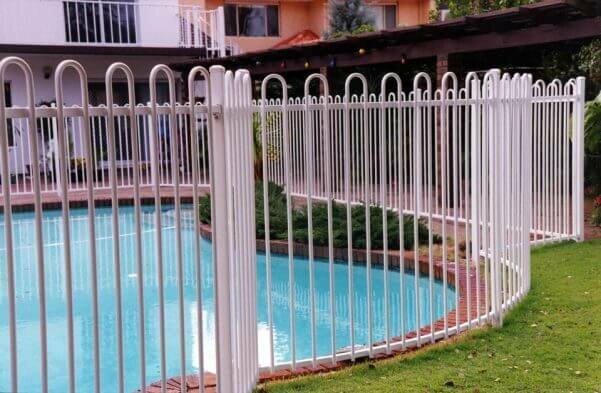 A nice example of customising an aluminium pool fence to suit your pool area. What do I need for a DIY pool fence? 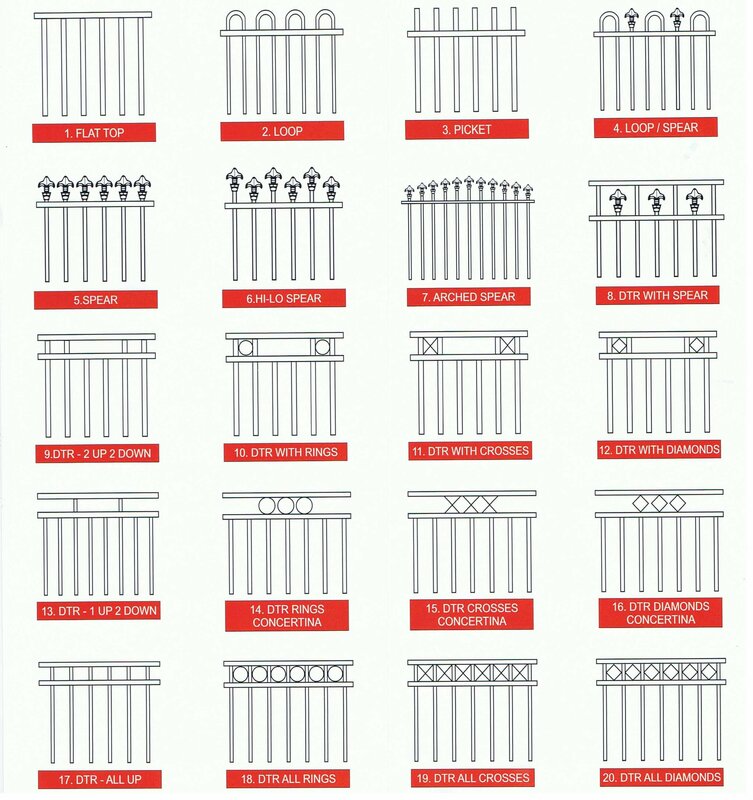 Here’s a great checklist, you’ll need panels, post, panel brackets to attach to the posts, a gate, a gate kit with hinges and self-closing latch. What are the styles of aluminium pool fence panels? 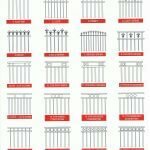 Aluminium fence panels come in standard styles of flat top, loop top, picket and then various patterns with a flat top. Flat top fences have vertical tube bars which are fixed and welded inside flat horizontal upper and lower rails. Loop-top fences have sections of tubular pipe bent through the upper rail so that each section of pipe forms two vertical bars rather than one. White aluminium pool fence with lop top. How much does aluminium pool fencing cost? To work out how much an aluminium pool fence will cost, the first thing to do is measure up the area you want to fence off. As a guide the pool fence panels will cost between $80-$100 for a 2.4m long flat-top panel. The higher price is if you want to choose a custom colour or if you want a loop top or pattern. The aluminium posts should cost about $30-$40 each. If you’re getting custom sizes, or just trying to estimate your overall panel cost, use a cost of $55/lineal metre for standard flat top aluminium fencing. Do aluminium pool fences require maintenance? In order to keep the fence looking great you should wash it once or twice a year with some mild detergent and warm water. If you live in a particularly harsh environment, like right near the seas, you might need to clean more regularly. Really though, an aluminium fence needs very little maintenance because it has powder coated so it will resist corrosion very well. 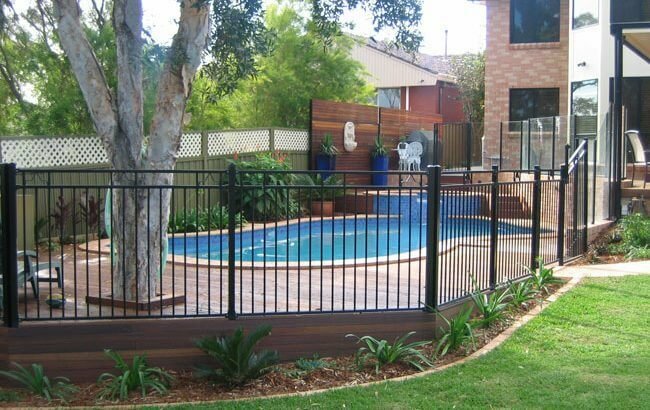 Aluminium Pool Fencing, DIY Pool Fencing, Pool Fencing Cost, Pool Fencing Panels, Pools. permalink.